The printer won�t take my cards (error #81). My cards get stuck in the printer (error #110). What do I do? My DTC 1000 won�t communicate. My ribbon keeps breaking (error #99). My printer shows a �Ribbon Release Error� message (#109 and 113). The Printer is unable to feed a card from the card hopper. Make sure that your card size is selected properly in the driver (CR-79 or CR80). Ensure that your printer is turned on and plugged into your computer. Check to make sure the USB port on the printer is not loose or broken. Make sure that there is not a print job stuck in the print queue. If the Ribbon is broken, repair by taping the Ribbon back onto the take- up core and manually advance to the next panel. Turn Off the Printer and unplug the power cord from the Printer. 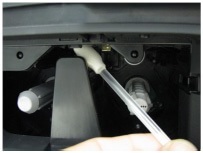 Open the Printhead Cleaning Swabs. Break it to moisten the tip. Swab the tip back and forth across the top of the Printhead. Allow to dry thoroughly before sending a print job. 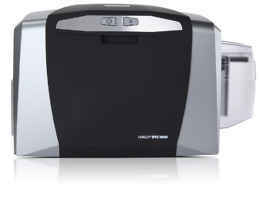 Open the Printer�s Front Cover, remove the Print Ribbon and close the Front Cover. Remove all the cards from the Printer�s Input Hopper. Use the Cleaning Card from the Printer�s and remove the adhesive backing from both sides of the card. If your Printer has a Magnetic Encoder installed, be sure to leave the small Liner Strip on top of the Cleaning Card in place. This small strip is needed to protect the Magnetic Head from the adhesives on the Cleaning Card. Insert the Cleaning Card into the Single Feed Card Slot until the card stops. If your Printer is equipped with a Magnetic Encoder, you must insert the Cleaning Card with the printed side up and with the small Liner Strip towards the front of the Printer. From your computer, open the Printer Driver and select Printing Preferences. Click on the Toolbox button under the Card tab. Click on the Clean Printer tab.